The costume is still in the "pinned-together" stage, but I've come this far in putting it together. Can't give up now! Its a cool photo, and a gorgeous costume! amazing!!! did you make this yourself or did you buy some pieces? Weee! Peackok feathers! Loving your costume, especialy the belt and the round medallion! beautiful ! ....where do you get the jewerly on it? Here in the Netherlands i cant find it. The photo is really nice - like the sepia tone and the change in contrast manipulations. Also - very jealous of the costume - that would definitely inspire me to take up belly dancing. Very beautiful photo and amazing costume! Sheherazade, you came back, sweet apple of my eyes, Lordy lordy, enchanting image, will last for ye thousands nights and one more! 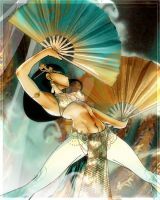 i love the photo and bellydance! Hooraaaaaay tribal fusion! This is such a gorgeous costume, I'm jealous. From one dancer to another. Wow I´m in love with this picture and the accesoires! Gorgeous - gotta love the green! I like the earrings flanking the big kuchi piece in the belt - clever and well-placed. Beautiful! I love the peacock feathers! is that a tribal custome?